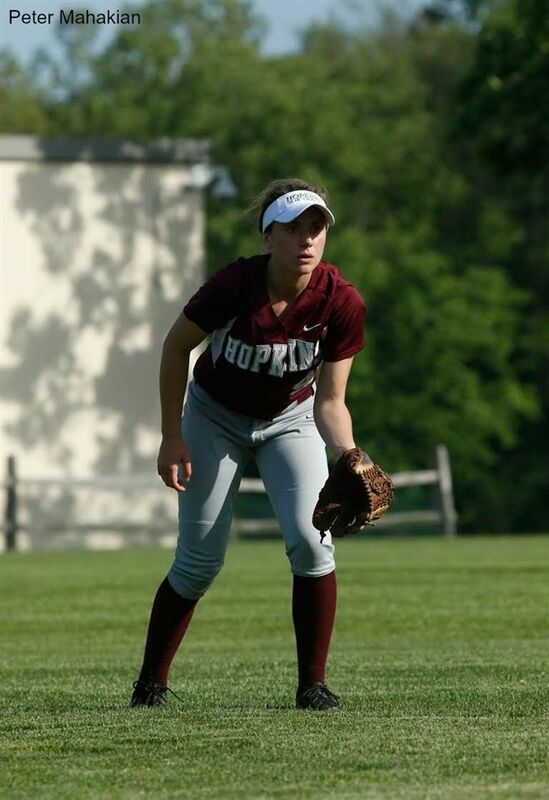 Gigi Speer ‘18 playing shortstop for the Hopkins Varsity Softball team. Sometime this year, Athletic Director Rocco DeMaio made an announcement in Assembly, creating a recurring weekly event called “Maroon Friday.” This may have seemed like a silly dress-up at first, but I think it is exactly what we need. Before I came to Hopkins, I wasn’t sure about the school because I wanted to go to a more athletically rigorous institution, where I would play sports at a high level, even if it meant the academics wouldn’t be up to par. What a fool I was. My Uncle Pete talked some sense into me, and I ended up applying to Hopkins. I was so nervous awaiting the results (for reference, if you’ve ever showed up five minutes late to class with a bagel in hand or if you’ve ever swam with sharks, that kind of butterfly-in-your-stomach nervousness) and was even more ecstatic to find out that I got in. I prepared to climb The Hill that fall, which included going to preseason for volleyball. I chose volleyball because it seemed fun to me: yet, when I told my older brother’s friends that’s what I was doing they just laughed and told me the program was a joke. And when I started basketball a couple of months later, I got the same response. And when it was warming up and finally spring time, and it was time for a sport that I had played before, I loved, and was good at, I got the same response I got the other two seasons: people laughed in my face and said softball at Hopkins was comparable only to the 2011-2012 Charlotte Bobcats or the Godfather III. The “haha alright” I got when I said I was joining the teams hurt, and made me feel like people didn’t care about these sports. I felt as if I should laugh at my teams too, and have no pride in them, if that was the norm. The reasons for these laugh-in-your face moments weren’t because of the players, they weren’t because of the coaches, and weren’t because of the athletic department. These moments were because it has been instilled in Hopkins students, faculty, and staff that we should be okay with being mediocre when it comes to athletics at Hopkins. Mediocrity is accepted when teams have losing records, don’t make the playoffs, or lose to Hamden Hall. We have an “at least you tried your best!” attitude. And when teams do make it to playoffs, do have winning records, or do beat Hamden Hall, it is very rare that the whole school feels a general sense of pride for those teams. Especially when those teams are girl’s teams. Although I just started talking to people about this disparity this year, I have seen little things that made me feel as if the team I was on was valued slightly less by the general public at Hopkins. It felt like I was Beyonce (a great feeling) performing at Coachella, yet although I’m giving the performance of a lifetime, everyone is at the other stage watching Jay-Z perform. But, it’s not just here. It takes monster teams like the UCONN Women’s team to convince people to come to games. They have to prove themselves. Only after countless championships and an undefeated season or two will people fill the stands. WNBA players are forced to play internationally in addition to playing in the American league in order to make a reasonable salary. The Doris Burkes of the world are rarely given the spotlight, and the USA Women’s National Soccer Team had to endure a multi-year legal dispute in their fight for equal pay. Although there are many reasons for this disparity, in the world and on The Hill, I believe (truly believe, like a kid believes in Santa... who is real, by the way, if there are any junior school believers reading this) that Hopkins is better than that and that we could do better. Some people may not see what I’m talking about when I say that there is an inequality in sports at Hopkins, yet I think it is most evident when looking in the stands for fans. This basketball season, we were playing Hamden Hall for the first round of playoffs. It was a game we knew we could win if we played well, executed, and trusted each other. We were so excited and it was like the match-up of the century, I’m talking Pistons v. Bulls, Larry v. Magic, Serena v. Venus kind of anticipation. Yet the only Hopkins people in the stands were the parents who could make it to the game, and Sam Phelan’s Nonna. I love to see Nonna, but I would have loved to see peers and other Hopkins students cheering us on. Having people there to support really does help, in my opinion, and it could have been the difference-maker in the second half. Now I know that the boy’s team had superstars like Edens [Fleurizard ’16], Charlie [Zane ’16], Drew [Nolan ’16], and James [Speer ’16] in the past who brought them success as a program, and I know that our Girls’ Basketball team didn’t have these kinds of players or accomplishments, but still, it’s Hamden Hall! I’m not saying that I expected to see the stands filled or I expect people at every girls’ athletic competition from here on out, but I think that we should have more pride, and people should want to go out and support our athletic teams. This is what Maroon Friday is all about. Showing pride every week for the school you go to. Be proud of our accomplishments, our hard work, and our greatness. And this isn’t limited to athletics. We have an award winning theatre program, robotics team, Science Olympiad team, great teachers, administrators, and students all with something special about them. That’s why we’re here. We are all special, and not in a corny way or the kind of “special” a mom calls her kid that likes to bite things. I mean that every single person on this campus, from to four-foot-tall-junior schoolers to Kai Bynum is on The Hill because they have something about them that got them here, and something about them that will take them wherever they want to go or do whatever they want to do. And we should be proud of that. Wear maroon, and wear all maroon from a beanie to the socks on your feet if you want to compete with Rocco! Just be prideful for going here, and don’t settle for mediocrity.